I enjoy drinking herbal teas and I indulge in the occasional cup of real tea. 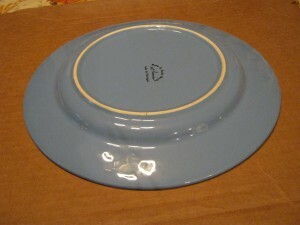 We’ll be painting the kitchen soon (I hope), so I was looking for some décor to match the blue color I’ve chosen. You can use this same idea using fewer clothespins to hold Christmas cards, important papers or anything lightweight and stiff enough to be clipped that you can imagine. It would make a great gift for the tea drinker in your life or the person who loves to display Christmas cards. First, decide how many clothespins you wish to use. If you’re using it for things like Christmas cards, you will want to consider using 14-18 clothespins. For tea bags, you can use 14-25 clothespins. I used 25 on my tea wreath above. Then, gather your materials. Scavenge a soda can tab from a co-worker for family member. Put down an old tablecloth that is ok if it gets messed up. 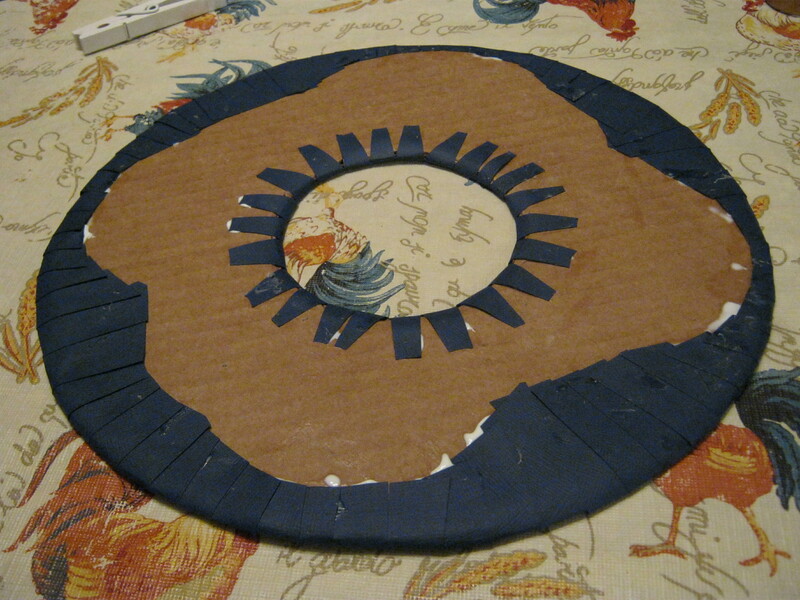 Lay out a pair of sharp-pointed scissors, a thinnish cardboard shipping box that has one side that is at least 12×12, one 12×12 piece of scrapbook cardstock or thick paper in a pattern or solid color of your choosing (I used Brazzil Typhoon), a dinner plate or other perfectly round item 10-11 inches across, a small plate or ramekin that is about 3-4 inches across, craft glue such as Ailene’s Tacky Glue, a hot glue gun, clothespins and spraypaint that complements the color of your scrapbook paper (I used glossy white). 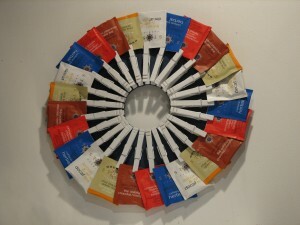 If you’re making this as a tea display, you will need some individually-wrapped tea bags, too. 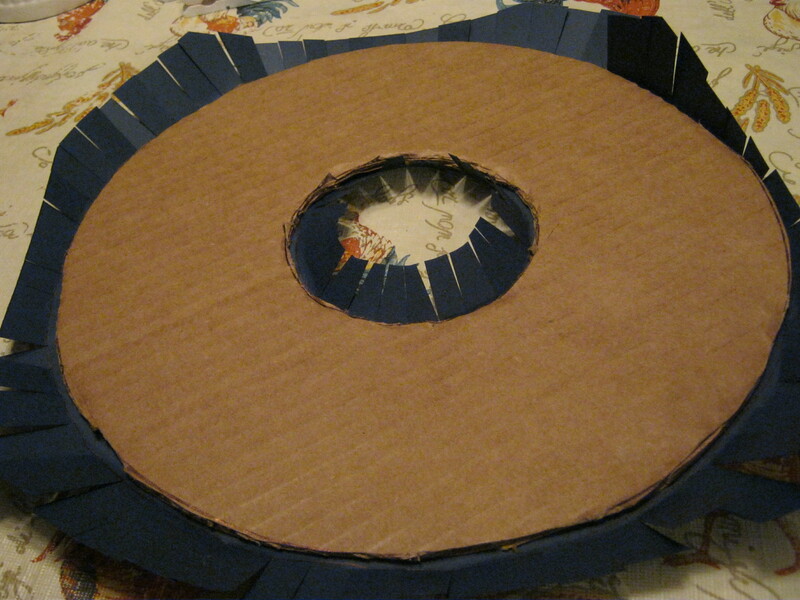 First, take your cardboard box that is at least 12 inches by 12 inches on one side, and cut out that one panel. Set it aside. On the other side on one of the flaps, attach all of your clothespins. Spray paint the clothespins thoroughly on both sides. Make sure you get the edges. Allow to dry for 2-3 hours then do any touch-up if needed. Allow to dry thoroughly. Meanwhile, take your plate and trace it on the cardboard you cut out of the box. 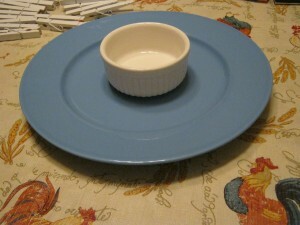 Place the ramekin in the very center and trace it. Make sure that in between the two rings, you have enough space to place a clothespin. It is OK if the clothespin hangs off the side for a half-inch or so. Cut out your ring. I used a rotary cutter. 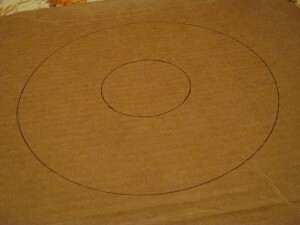 Place the 12×12 scrapbook paper face DOWN and place the cardboard ring centered on top. 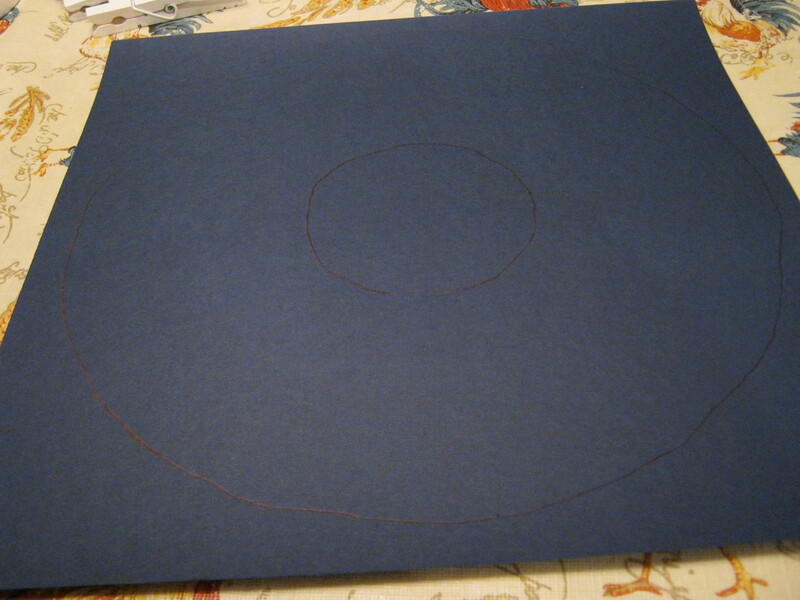 Trace both the inside and outside ring onto the paper. 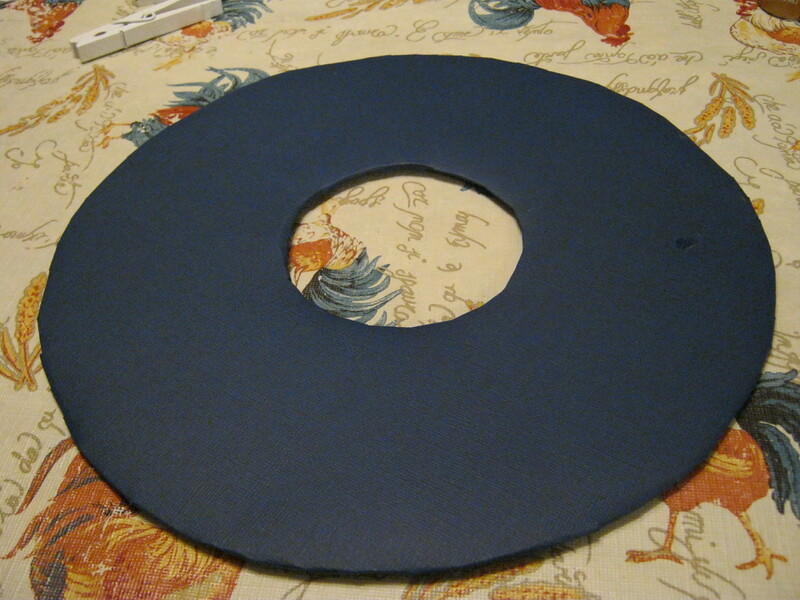 Take the paper and round off the corners, about an inch from the largest ring. Cut the paper, perpendicular to the largest ring, right up to the line you drew. You’re cutting the paper so you can bend it around to the back side and glue it to cover the cardboard. Cut the middle the same way, right up to the line. 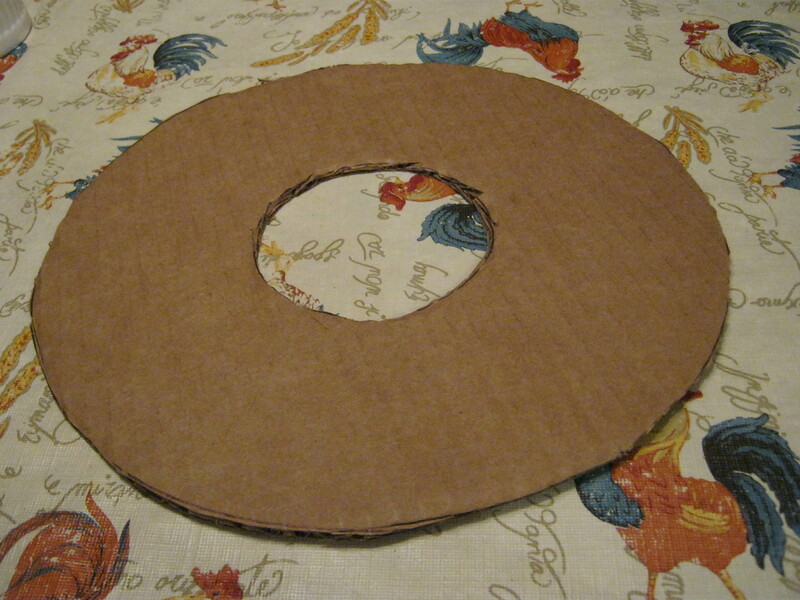 Again place the paper right side DOWN and place the cardboard ring on top. 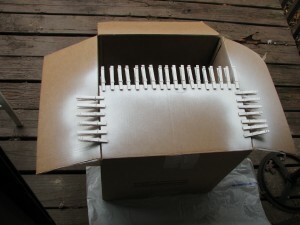 Bend the tabs of paper around the cardboard then glue them down. Allow the glue to dry completely. This is how it looks from the front side. On the right side, lay out your clothespins equidistant from each other. Start with laying four out and work your way around. 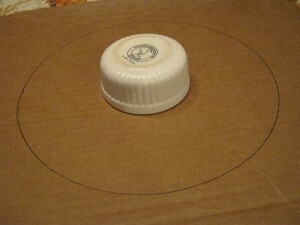 Lay them with the clip end pointing outward, and place the edge of the end that you squeeze up against the inside ring. 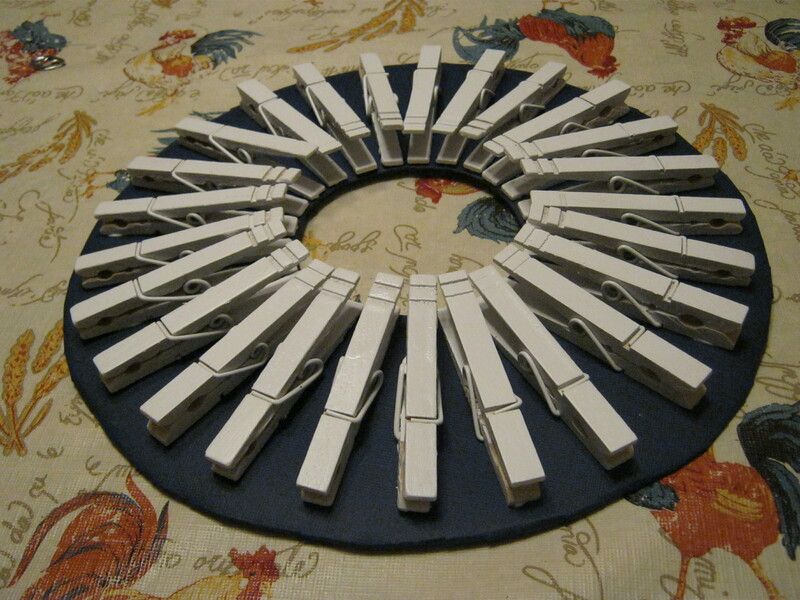 Glue the clothespins down to the ring. I used Ailene’s Tacky Glue. Allow them to dry thoroughly. Flip the ring over and decide where you want the pull tab to be. The top of the tab is what you will use as a hanger, you will cover the bottom half with glue. Put down a generous dollop of hot glue, press the lower half of the pull tab into the glob, then cover the bottom half of the pull tab with another generous dab of hot glue to secure it in place. Allow it all to dry thoroughly and clip on your tea bags. Voila!